I posted this comment on facebook and it created reactions from ‘if it would only work’ to ‘I say that every morning’. You could see the difference between those who believed in themselves and those who did not. The more positive feelings you have about yourself, the higher your self-esteem. The more negative you feel about yourself, the lower your self-esteem. Low-self esteem can affect your mental health, the way you live and how you interact with people. If you have plenty of self-esteem, then you can feel capable, productive, lovable and self-confident. On the other hand, low self-esteem can make you feel worthless, incompetent and unloved. If you hold negative thoughts and beliefs about yourself than you may find you are unable to deal with the stresses of life. In the longer term you might develop more serious mental health problems such as eating disorders, depression or social phobia. If you have problems with your self-image or how you feel about yourself, then it is time to think of your self-esteem. Self-esteem affects the way you live. Can I break the chain of negative thoughts? Yes, lack of self-esteem has beliefs at its core. Change your beliefs and you’ll feel better. So, start to think positively about yourself. Make it a point to be your own best friend. Start by writing down those negative thoughts you have about yourself and challenge those beliefs. And then write a list of 10 things that you are grateful for EVERY DAY. You’ll soon start to recognise things that are worth believing in – not to mention yourself. For further information, have a look at Mind website on tips on challenging those beliefs. Additionally, you could find help through online counselling. 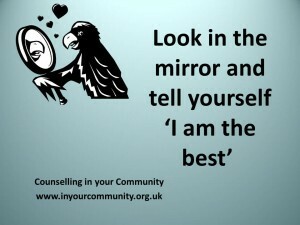 Feel free to contact me at counselling@inyourcommunity.org.uk for more information. This entry was posted in Depression, Self-esteem and tagged low self esteem on May 10, 2013 by Hazel Hill.